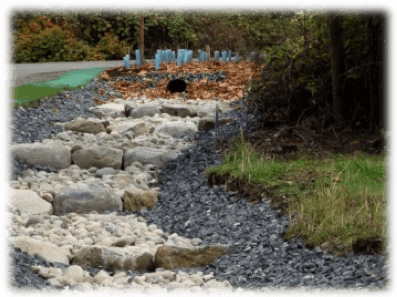 This project was designed to address the water quality concerns regarding the stormwater runoff entering the Birch Bay Watershed at the Birch Point location. It consisted of replacement of the existing stormwater facilities, addition of new stormwater facilities, installation of treatment swales, replacement of approximately 600ft of stormwater pipe, and replacement of a failing marine outfall structure. Due to the ecologically sensitive nature regarding marine discharge, it was essential that the design provided water quality protection as well as to allow for construction in an environmentally fragile shoreline area. The design for this project successfully met these challenges while in compliance with Washington State’s water quality standards and functional performance guidelines. Completion of this project resulted in reduced localized flooding, adequate water quality treatment, increased stormwater flow capacity and improved maintenance access for these facilities. LDES prepared the plans and specifications (bid and contract documents), prepared change orders during the project (the project had TIB funding and the bid documents had to reflect the required regulations and procedures), and tracked project budget using an detailed excel spreadsheet.